Pitchfork, smitchfork. 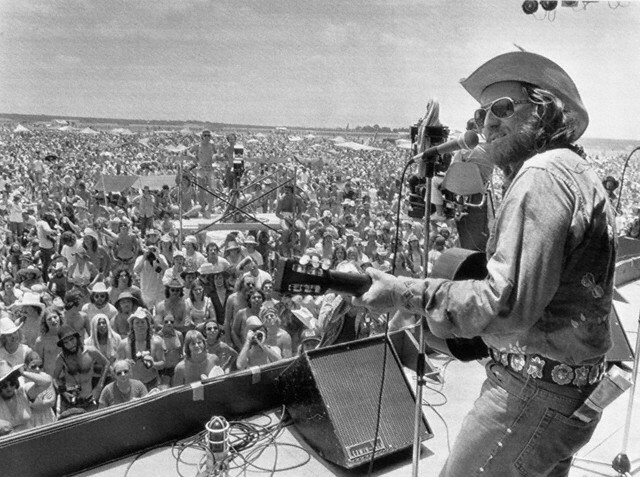 Send me back in time to 1974 and Willie Nelson’s 4th of July Picnic, please! Ok, so I know that’s not possible, but tonight, I get to pretend I’m there, at least for a couple of hours. You see, I’m going to see Yabo Yablonski’s documentary, simply named “Willie Nelson’s 4th of July Picnic,” and I’m so excited. Filmed at the Texas World Speedway in College Station, the movie showcases performances and (more interestingly?) the behind-the-scenes shenanigans of the best outlaw country superstars, including Waylon Jennings, Kris Kristofferson and of course, the man throwing the party, Willie Nelson. Other notable performers at the ’74 festival include Leon Russell, Ricky Nelson, Jimmy Buffett, Doug Kershaw, B.W. Stephenson, Jerry Jeff Walker and Michael Murphy. Some reviews mention Ricky Nelson, performing. If he’s in this movie, it’s truly just icing on the cake. Here’s a shot of Willie, kicking off the event, which was sponsored by Lone Star beer. A crowd of more than 150,000 was expected to attend the three-day festival. I feel really lucky to be able to see it on a big screen, not to mention with two of my favorite fellow old country lovers. If you’re in the Twin Cities area, tickets are still available here. P.S. The photo of Willie is from The Selvedge Yard. This entry was posted in Uncategorized and tagged country music, good times, music by highplainsthrifter. Bookmark the permalink.